The abundant cultural diversity of Alaska’s largest city has inspired a new collaboration between Anchorage and an artist co-op. The goal is to improve the community through creativity and collaboration. Located in downtown Anchorage, in a space that once held a Starbucks, the Anchorage Artists Co-op could be mistaken for just another art gallery. 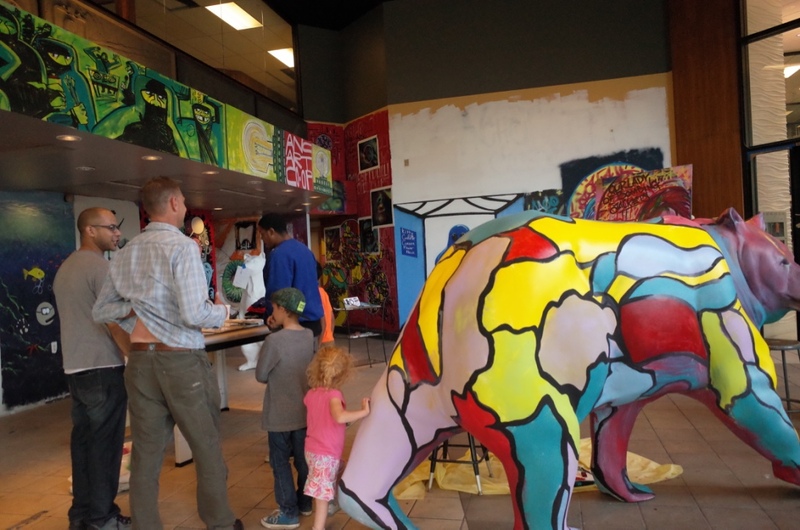 An eclectic mix of floor to ceiling murals cover the walls and two life-size bear sculptures stand in the middle of the floor, but there’s a lot more going on than just visual art on display. 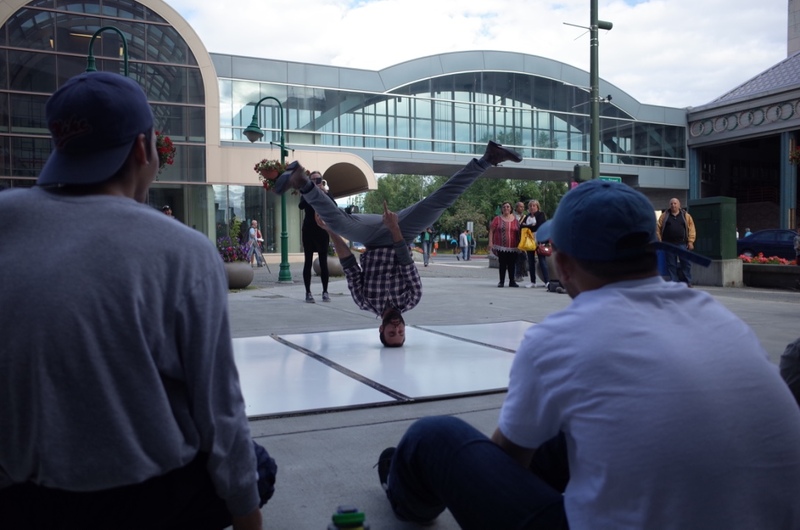 Outside, dozens of people have stopped by on a Thursday evening to watch break dancers perform, while a D.J. blasts music from a P.A. The KeyBank Plaza is temporarily transformed from a sleepy corporate space to a hive of pounding beats and kinetic energy. Special assistant to the mayor, George Martinez takes over the mic. He’s traded his business suit for a t-shirt, jeans, and sunglasses. He’s referring to what the co-op calls their Thursday Night Cypher, what they hope will be a weekly collaborative art event that showcases the culture and creativity of Anchorage. In addition to break dancers, they’ve also showcased custom low rider cars. Martinez sees a partnership between the co-op and the city as a means to develop a sustainable ecosystem for local artists and in turn, tap into that creativity to benefit the city. “This is an innovative potential way to integrate artists economically, let alone informationally, to the city, but then also we all harness this together, grows potential tourism and just increases and supports that tourism traffic, which also grows the opportunity for our local artists to have access to different markets,” Martinez said. While this idea of incorporating the city’s artists in the basic infrastructure of Anchorage is in its early stages, Martinez said that the possibilities are nearly endless. There are the typical goals such as decorating building exteriors, to the less obvious– such as using artist to re-imagine how crosswalks can be designed to be both aesthetically pleasing and safer. 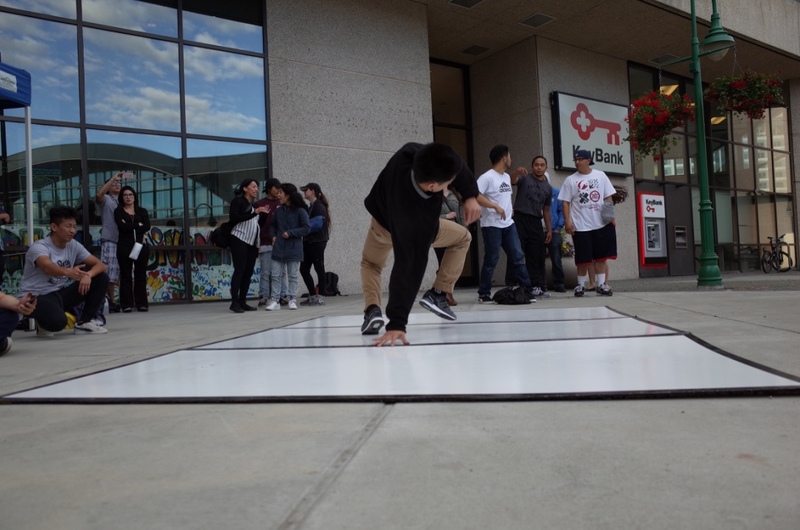 The co-op has been working with the Youth Advisory Commission and the Anchorage Downtown Partnership for various art projects and workshops. Recently the co-op participated in painting a mural downtown on 5th and D. Other art displays on public spaces are in the works as well. Lee Post is on the co-op’s steering committee and is using his experience as an artist and his career counseling youth to help people find their way into the arts. “I really want to take away any perceived barriers that somebody can take part in the Anchorage art scene. That basically, if you can make art, if you take even the first baby step into creating something, there’s going to be a place for you and the city is going to be receptive and help you develop,” Post said. Even though it was the first night of the event, the crowd was responsive. Passersby would occasionally join in. A KeyBank employee even stopped to bust some moves before heading out. It’s the type of involvement with the public and the artists that the co-op hopes to see ultimately help make a positive impact.